With the holidays here, I bet lots of you are planning on traveling (we are). I love nothing more than to break up a road trip with ridiculous little stops, much to the chagrin of my car companions. They grumble, but they secretly love me for it (I hope). If you're looking to break up a long car ride on your way to grandma's house in the upcoming weeks, here are 10 giant statues that exist just for your photo ops (OK"¦ and sometimes to honor the person depicted in the statue. Whatever). 1. The Jolly Green Giant "“ Blue Earth, Minnesota. He's 55 feet tall, cost $43,000 to make, and attracts 10,000 visitors a year. You could be one of those visitors! If you hurry, you might catch him in his holiday attire "“ a giant red scarf. I'd be more worried about keeping those scantily-clad green legs warm, but that's just me. I guess snowpants might look silly on the Jolly Green Giant. 2. Superman "“ Metropolis, Illinois. As the home of Superman, it's not surprising that a building-sized statue of Clark Kent's other half dominates the town square. I've actually been to this one "“ that's my husband snapping the picture. 3. Paul Bunyan "“ Minnesota. Or Bangor, Maine. Or Flagstaff, Arizona. Or Manistique, Michigan. Apparently there aren't a lot of states without a Paul Bunyan statue. 5. Abraham Lincoln "“ Ashmore, Illinois. If you're in Illinois with time to kill and just haven't satisfied your giant statue urge, head three hours north and visit the World's Largest (and possibly Ugliest) Lincoln statue. I'd like to disagree, but it's pretty darn ugly. Picture by Ken Lang via Roadside America. 6. Alabama "“ Fort Payne, Alabama. Three of the members of the band Alabama are from Fort Payne, so live-sized statues of the once-popular country group almost make sense. 7. Barry Goldwater - Paradise Valley, Arizona. If you've always dreamed of having your picture taken with a nine-foot statue of Senator Barry Goldwater, all you have to do is go to Paradise Valley, Arizona, to realize your life-long goal. Goldwater retired to Paradise Valley after serving three decades in the Senate (and serving as the Republican candidate for President in 1964). 8. The Virgin Mary "“ New Castle, Delaware. Oil stain Mary? Toast Mary? 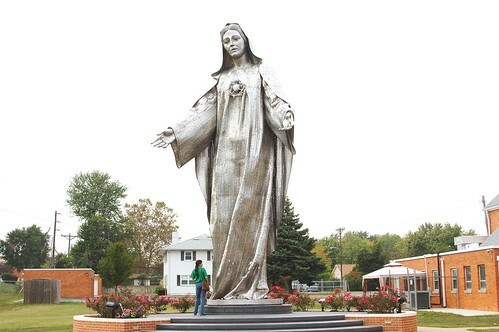 Forget it "“ this one is made of more than four tons of stainless steel and stands 34 feet tall. 9. James Brown "“ Augusta, Georgia. A life-sized statue of the Godfather of Soul can be found in the town where Brown grew up. 10. The Fonz "“ Milwaukee, Wisconsin. This statue goes a step further "“ it's not just bronze, it's colored bronze, so you can spot the Fonz' unnaturally blue denim from a mile away. He can be spotted giving his famous thumbs up along Milwaukee's RiverWalk. Again, that's Paul with Mr. Fonzarelli. I don't pose for pictures, really, so he's always my guinea pig. The statue looks pretty little, but Henry Winkler is only 5'6" in real life. 11. Mary Tyler Moore - Minneapolis, Minnesota. OK, this obviously makes 11, but I felt bad including the Fonz and not MTM. In the opening credits of her namesake sitcom, Mare tosses her hat triumphantly in the air. This statue at the Nicollet Mall in downtown Minneapolis recreates that moment. I know there are tons more to add to the list "“ I went with specific characters as opposed to vague Muffler Men just for the sake of the Quick 10. If you have giant statue in your hometown that you think people need to know about, be sure to tell us in the comments. And if you end up stopping at any of these during your holiday travels, send us a picture! I bet we could make a pretty entertaining photo gallery.